The construction of the new Gold Coast Dharma Realm is expected to be completed by the end of 2016. It is built on the crown of the hill surrounded by the native Allocasuarina littoralis (black sheoak) forest. The seeds in the “cones” of Allocasuarina littoralis are the major food source for Glossy Black cockatoos, one of the more vulnerable cockatoo species in Queensland. For this reason, the location of the temple was carefully chosen in consultation with the local council and environmental scientists to minimize the impact ​to the cockatoos’ natural habitat. Unlike a traditional Buddhist temple that faces a large courtyard, Gold Coast Dharma Realm’s entrance opens into the Allocasuarina forest, acknowledging the Glossy Black cockatoos’ habitat. The entrance is oriented toward the east to receive the first sun in the morning, at the same time capturing the prevailing northeasterly breeze which ventilates the temple. Gold Coast Dharma Realm consists of the Shurangama Buddha Hall and service buildings at the back of hall. The hall is approximately 210 square meters and surrounded by veranda with wood columns that leads to the service buildings at the back. The design of the temple is based on Toshodaiji Temple in Nara, Japan. 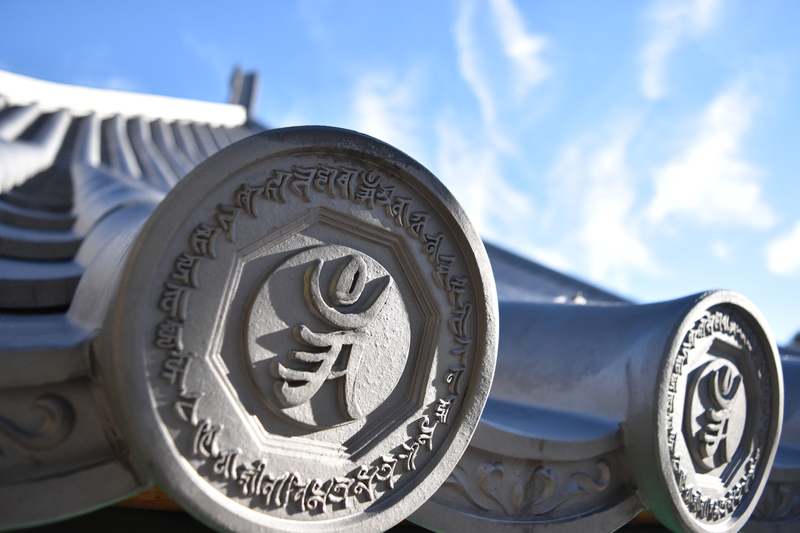 It was founded in 759 by the Chinese Buddhist Monk Jianzhen, who was the first Chinese monk to bring the Vinaya to Japan. 1. A modest curved hipped tiled roof with a slight upward curvature at the end of hip. 2. Expressive timber framed structure ‘dou gong’ framing system. The system is a series of cantilevered wood brackets on the top of the columns to support the crossbeams that support the roof structure. We draw design ideas from these three characteristics, maintaining the modest form of the roof, expressive supporting structures and use traditional building materials such as timber, stone and clay. From the brick base to the timber columns and the metal plate that connects to the timber roof truss, one can begin to appreciate how the heavy terracotta roof tiles are supported. There are three sets of sliding doors in the front of the temple and one set of sliding door on both sides. The sliding door panels are approximately 3.6m tall and 2.4m wide. It is in a similar proportion to the three bronze Buddha statues which are about 3.2m tall. A large main entrance for all three doors is to convey grandeur as the visitors enter the Buddha Hall and to appreciate the scale of the Buddha statues. The large door openings also provide more natural light for the hall as compared to traditional temples and also to maximize natural ventilation. When the sliding doors are fully opened, the exterior Allocasuarina forest is blended into the interior. "A Straight Mind is the Way"
2. Reducing the size of the front yard by keeping the trees as habitat for the endangered birds demonstrates the Temple’s willingness to accommodate and value all forms of life. 3. Although with this design one cannot directly see the new Buddha Hall, and must look through the woods, this actually reflects the idea that the new Buddha Hall is like our own Buddha nature, not everyone can find it easily, even though it is right there in front of us. We need to cultivate diligently to slowly discover it. We must look through the trees. The Buddha nature is there, but we should not be concerned about failing to reach it – merely because we can’t see it clearly. As long as we follow the paved road — the Buddha’s teachings—and walk the path, we will successfully reach the destination, the Hall, and Buddhahood.